- Inventory system - put away items for later use. You can now set hotkeys for your favorite items. - You can sell your unwanted items and equipment to shopkeepers. - You can disable/enable equipment in the inventory menu. For example you may want disable the paste in a situation where you need to drop a bomb down a hole instead of having it stick to the wall. 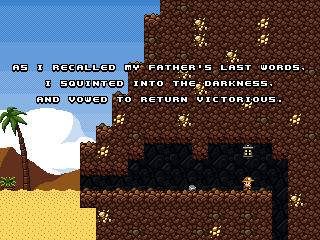 - Quick restart - start a new game without returning to the title screen after you die. - Support for playing custom levels made with Editor Plus (ANSI and UTF-8). - Customize length of time before the ghost appears (or never!). - You can hold UP to fire the bow upwards. - Knock items around and open crates and chests with melee weapons (whip, machete, mattock). - You don't drop items when doing a flip hang (optional). 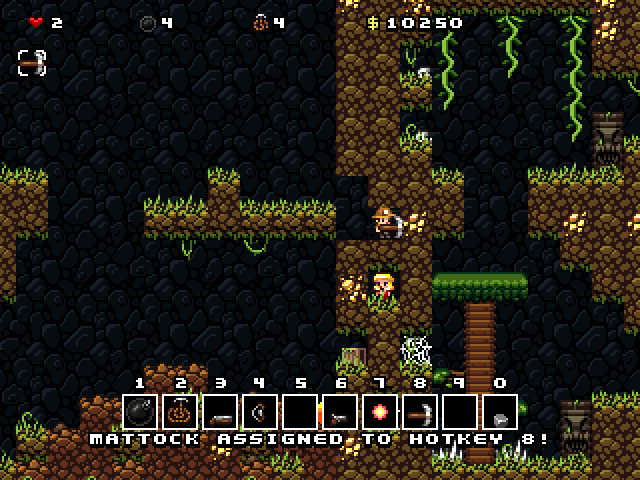 - 'Bizarre' mode adds an extra challenge, with new enemies and level layouts. - Portable - your scores and progress are saved to a file in the game folder instead of the Windows registry. Take it with you on a USB stick! - Gamepad users: There is an option to use the 'purchase' button instead of 'up' to enter doors. You can also set custom labels for your gampad buttons as they appear in-game, so they match your gamepad model. Many features can be turned on/off (including the inventory system) or otherwise adjusted to your taste by using YASM_Config.exe. 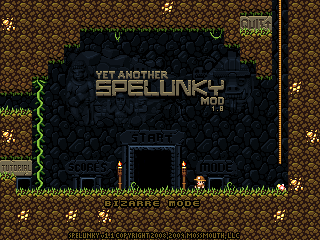 - Option for player to be able to change between walk/run speed in mid-air without touching the ground first (like Spelunky HD). - Option for improved water movement. 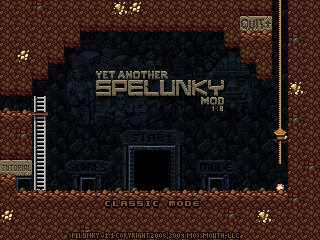 Press down to sink faster, press up to sink slower (from Spelunky Natural). - When stunned enemies are about to regain consciousness, the star above their head will spin slightly faster. - Prevented melee weapons from nudging items that were intended to be stuck/hidden inside solid walls. 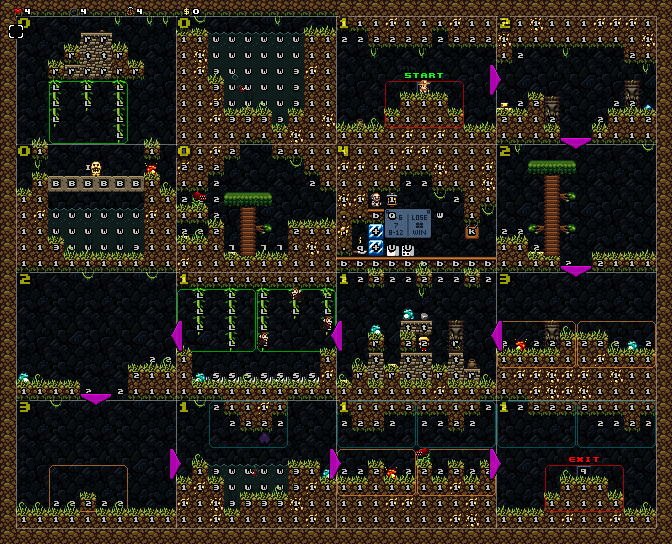 - Made it easier for player to jump up into 1 block wide gaps. - Wall graphics will be updated when nearby walls have been destroyed to show detailed top and bottom edges instead of looking flat. - Destroying the stone pedestal holding a gold idol will now trigger the trap. 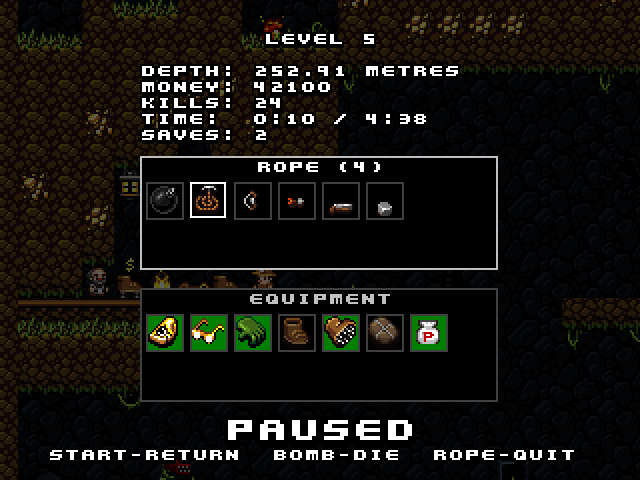 - Prevented loss of bomb bag and rope pile item (after pulling them out of inventory) when another item was pulled from inventory while they were still being held. - Improved explosion collisions. If there is a wall between an explosion and a damsel, the damsel is likely to survive the blast. Also, a cluster of bombs will trigger each other faster instead of causing an delayed series of explosions that rises into the air. 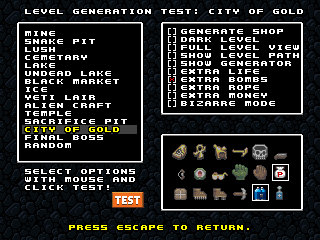 - Test chamber has option to display solution path to exit and level generation layout. 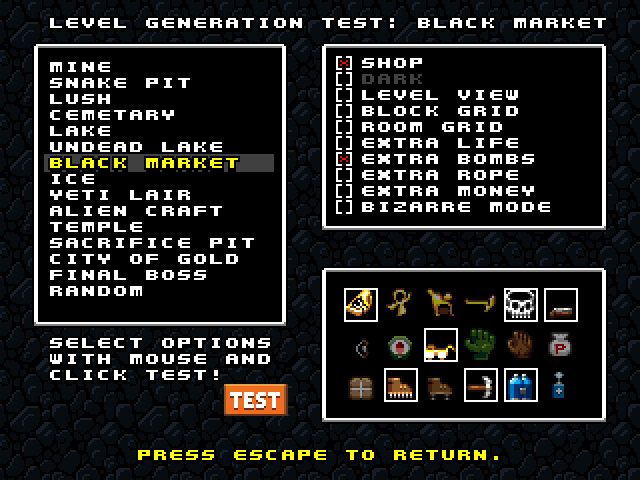 - In-game help menu (press F1) for controls, inventory system, and selling to shops. - Support for sprite mods - create a 'sprites' subfolder, drop custom sprites there and the game will load them on startup. Try the shopkeeper player sprite pack. I didn't know imperial measurements could be converted to the (clearly superior and sense-making) metric measurements! Was it already built in or did you add the option yourself? Either way, good job! I like the inventory option! Even though it does slow the flow of the game down a bit, and perhaps some way needs to be worked into it so the menu does not pop up all the time and so there's a quick way to browse through your items without opening an immersion-ruining menu, it still adds a very nice mechanic to the game and most certainly makes it easier to play! Otherwise, the menu is nicely balanced so one can't carry heavy, non-items items (LOL?) like damsels and what-not. My only complaint, except what mentioned above is how there's no option to make the window a bit bigger or make the game fullscreen! That option would much improve this near-excellent modification! Finally, we need a more creative title for this mod. How about 'Inventory mod' (meh), 'Equip mod' (errm), or perhaps 'Wield mod' (cool!)? Suggestions: ability to sell items to shopkeepers? Otherwise this mod is very cool. Adds an interesting new level of strategy, though it does make things a bit easier. Perhaps some new challenges need to be invented in order to balance this out? Bug: Equipping an item and then switching your item equipped to anything else makes you lost that item. Also, you should go to this thread: http://mossmouth.com/forums/index.php?topic=1246.0 and provide this bit of programming to this project, I'm sure they'll go for it. The metric conversion wasn't built in, but was very simple to add. I also acknowledge the metric system's superiority.. I see your point about immersion-breaking. An alternative could be just to have the switch key cycle thru all your items without pausing the game, or something like the way you cycle thru items in the Rune Factory games on the DS. Selling held items shouldn't be much a problem, i'm not sure how selling worn items would work yet. I'll check it out. That sounds like a big deal! EDIT: The download link has been updated with a fix for this. very nice work! Did you use globals or an array/list? I was about to get started on this for my mod, using a list array... Will you post the code for me to look over and use in my work? I'll put credits ect..
Small update for those that wanted a way to increase the difficulty of the game to balance out the advantage of having an inventory. You now have the option of increasing the amount of enemies or traps generated in levels in the settings file. New download link in first post. Wow this is cool. thanks a lot! 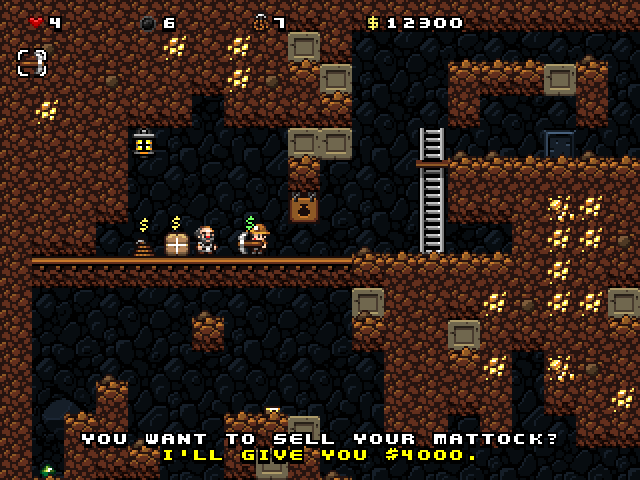 Second, you can put items you haven't purchased into you backpack/inventory without angering the shopkeeper. Guess out of sight out of mind is true after all. Thanks for the comments and bug-finding, guys. The shopkeeper should now be aware of all shoplifting techniques! The download link has been updated. Is it just me, or does this break the Moai+Ankh behavior? I stood on top of the Moai and bombed myself... it opened but I stayed dead. Things that hop are evil. After some testing, I see that this happens in the original game too. In the instant you were revived inside the Moai, the explosion from the bomb you left on top of it was wide enough to penetrate the top of the Moai and kill you again. The Moai itself is indestructible, but it doesn't protect you from explosions on the other side of it. Also, when your character is blinking for a second or two after being hit/revived, you are invulnerable to enemies, but not explosions. I've fixed it so this can't happen for the next release. Thanks for finding it. Also, the current version is already fixed so you don't have to worry about being close the Moai when trying to get inside it. You can die anywhere in the level and you will still be revived inside the Moai.. so if you like you can recklessly explore and not worry if you die and the Moai is far off-screen. I see. I guess that kind of make sense. In the regular game I normally use ESC&F1 since bombing yourself or anything similar makes you lose your carried item, but obviously this isn't a problem in YASM, so that explains why I never noticed it before. Thanks for investigating it in any case. Now I can go back to playing without fearing my efforts will be for naught. P.S. While I'm at it, I might as well mention another very minor bug. When you drop off the Damsel at the exit, her icon stay in the top left until you pick up something else or leave the level.